Where art meets life's celebrations! 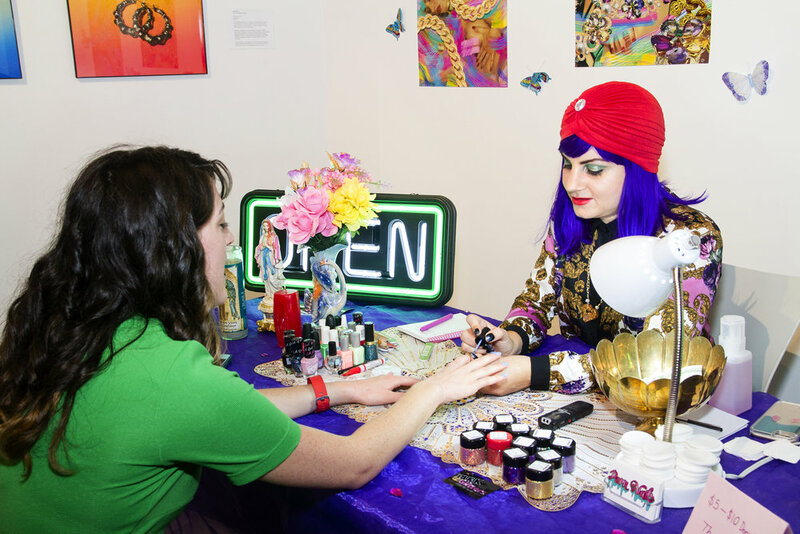 Want more inspiration for your Creative Union through the eyes of a socially conscious curator with a passion for art and love? Come along on this creative journey to see what inspires Creative Unions, including my favorite artists, exhibitions, and venues. Plus, you will have the chance to go behind the scenes and meet my clients so you too can get ideas on utilizing art to bring out your unique expression in a truly one-of-a-kind life celebration. People have told me: “This was the best show I have EVER seen in Baltimore”...“Museum quality… “My favorite place!" and much more. This monthlong art exhibition and wedding was even featured on Hyperallergic and The Baltimore Sun! 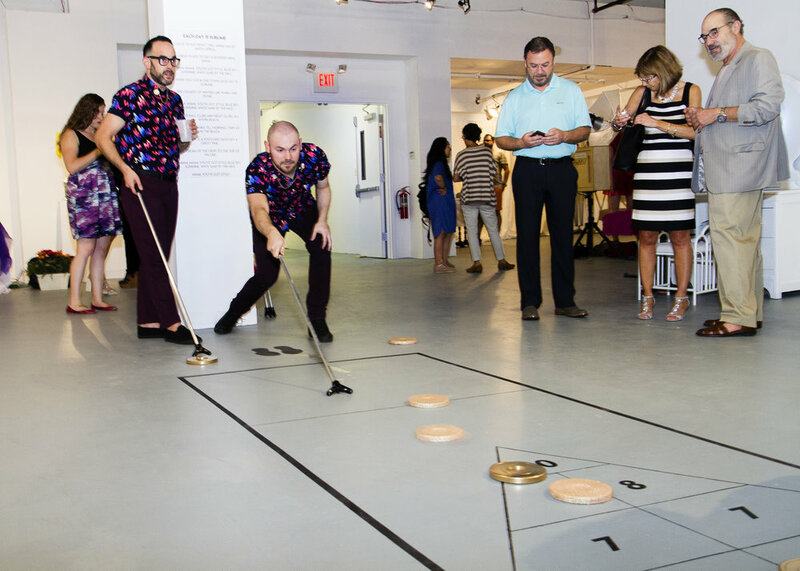 Nick Horan & Zachary Z. Handler were the lead organizers and artist couple who wanted to get married in a Golden Girls inspired art exhibition. So they emailed me before Creative Unions became, well...Creative Unions! Read about the story about how it all started here (I swear, it’s like they read my mind before even meeting me). Carlyn Thomas of Terrault Contemporary (aka an art angel) was the co-curator who helped me manage this beast! Ask any wedding planner, and they will brag about the linens they chose, the outfits their clients wore, or how boho-chic their dinnerware setup looked. But this was different. 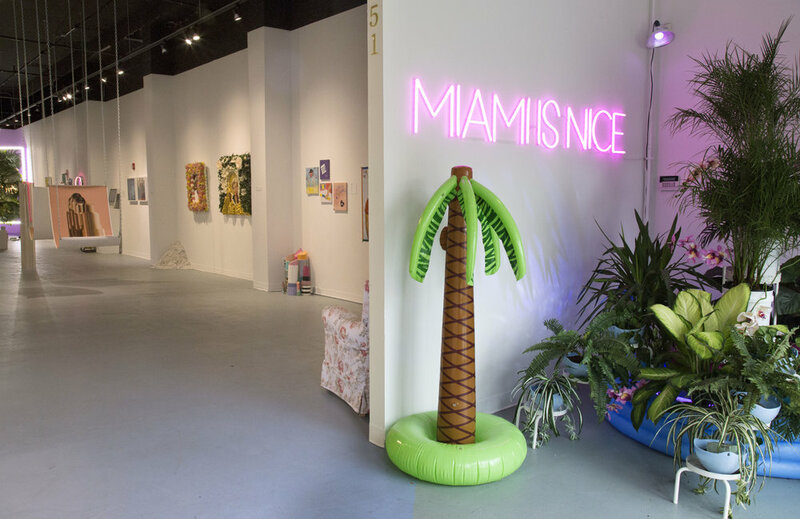 Simply put, it was a monthlong art exhibition full of art that questioned who Miami is nice for, what it means to be queer, combined with art about 1980's Miami, neon, and escapism. It was a Creative Union. A Creative Union is a specially curated art exhibition and marriage ceremony that brings people together to celebrate and express your love story. Our mission was completed as we created a 1980's Miami escape from the struggles of being queer under today's political climate. 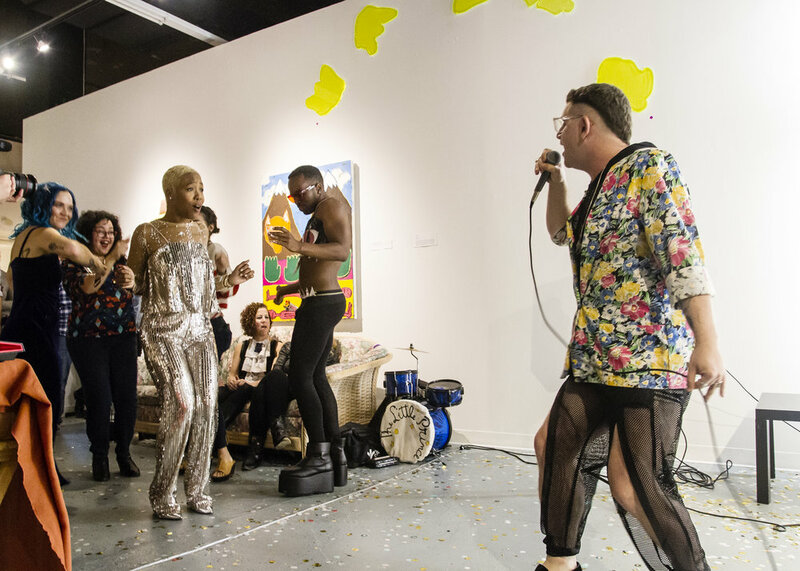 This art exhibition was a temporary home to artworks by 45 artists (yup, you got that right - 45 :wink:), a series of public programs, a photo booth (aka Blanche’s bedroom), hundreds of pounds of gold glitter, and Nick & Zach’s wedding. Miami is Nice served as the ultimate setting for a gay wedding celebration in order to inspire a world where love wins. Three public events became a natural part of the exhibition as imagined by Nick & Zach, so that the greater Baltimore community from all walks of life could enjoy the month long celebration with the help of Creative Unions Event Design, Management, and Consulting services. There were too many emotional stories to tell. It was hard to only pick 5 (Part 2 coming soon, I guess). I am not sure how to document and capture all of it...but all of these moments will be in my heart forever. Thank you to all the artists who provided this platform for the community to shed smiles, tears, and sniffs of 80's perfume nostalgia. Oh, and thanks to the puppies that came through too. After selling artworks with proceeds donated to two LGBTQ organizations: SAGE and Trans Women of Color Collective, I was proud but also sad to see this exhibition come down. I still think about it often, and get teary eyed sometimes, but below are more of my favorite moments with old and new friends who visited "Miami is Nice". You can see more behind the scenes moments on my personal IG @michelleigomez and follow @creativeunions to see what is next! Hint: an afrofuturist themed art exhibition and wedding in DC, coming next year! Besides the fact that over 500 people from all walks of life joined us for a steamy opening that felt just like a Miami summer, I absolutely loved starting a conga line thanks to Gloria Estefan. 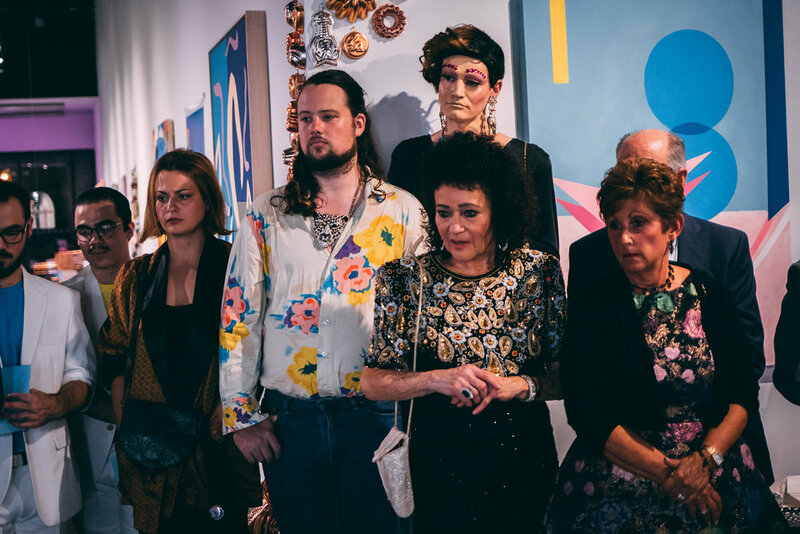 I was wearing my Mom's vintage 80s sequin top from Burdines, dancing with friends from Miami and Baltimore in an art gallery. I was basically living my best life. In fact, that's how I always imagined my dream life. I then cried in front of George Ciscle. If you do not know him, look him up. and touching other interactive installations and sculptures! All of that fun stuff listed up there? ^ That is art. And a very fun art opening! Over 100 Golden Girls fans joined us as we took photos in our Pixilated Photo booth in Blanche's bedroom (thanks Accent Wall! 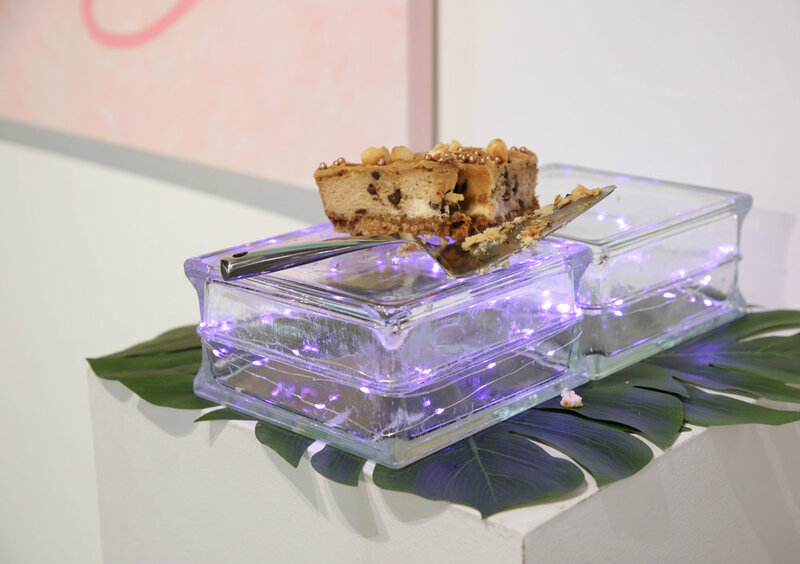 ), we devoured amazing cheesecakes made by Travis Marley with sparkling pink wine, talked about Stan's experiences on the Golden Girls set, shared childhood memories of this iconic television show, and discussed art making as a form of resistance in the age of Trump. One story that particularly moved me involved a Puerto Rican gay man who watched The Golden Girls on repeat with his hardworking mother sharing laughs every day. I absolutely loved all of our 13 performances from our queer performance evening (and closing reception!) My favorite performances truly represented two worlds that beautifully merged the cultures of Miami and Baltimore. Dr. 305 did some funny AF stand up comedy making jokes about her move from the 305 to the 410. She ended her skit with the line..."But Baltimore is nicer! Neru & The Hippy Trippy Collective ended the night with dim lights and poetic rap, making us all feel reflected and at home in Baltimore. The queer performance evening ended with all kinds of age groups dancing together in Halloween costumes for the occasion! PS - That night, we also hit over 1,600 guests, just look at the joy in my face! Also my fly AF nails were customized just for Miami is Nice by Power Decals! 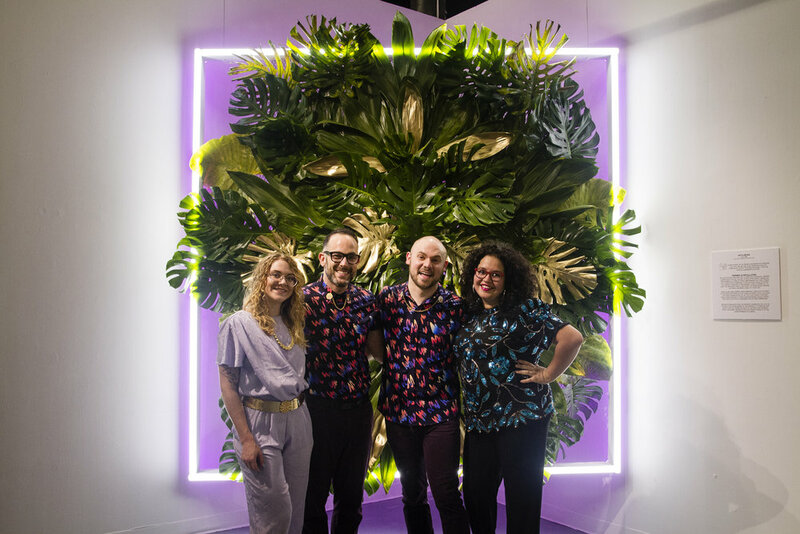 The morning of the wedding, the entire team changed the exhibition, adding sculptural 80's centerpieces made by Alice Gadzinski, a white balloon installation called "3pm Showers" covering the ceiling, and Golden Girls decor. Their ceremony took place in front of a specially made sculptural backdrop titled “#Lovewins” by Anya Mizani. Anyone who visited the show before and after the wedding was invited to take a picture in front of that backdrop with their loved ones too! Nich & Zach's vows were just as creative as the show itself, and included a keytar rendition of “Thank you for being a friend” by their officiant Nyugen Nyugen, some episode clips of the Golden Girls, a marinara sauce ritual, vows performed in art jargon, and Golden Girls masks worn by the audience! We danced the night away to 80’s music with grapefruit shandy in our hands after more creative performances by their closest friends. The Golden Girls inspired decorative remnants, the vows, and the balloons from the celebration stayed in the space for the remainder of the exhibition as an additional art installation. The intention behind this was to symbolize how quickly the saccharine opulence of the 1980s came crashing down, and reminded all viewers of the ever-present fragility of the queer experience in America while paying homage to those four remarkable female characters who played such a prominent role in their upbringings. There was also fresh cheesecake available in the exhibition every day after the wedding. Warning: So this moment involved eating leftover cake crumbs the morning after the wedding...please don’t judge me (I was slightly hungover)! The next morning, I opened up the gallery so the public can see the additional art we added to the show for the wedding + the mess we left behind after dancing to 80's music all night long. Guests saw it all...confetti all over the floor (and in my hair), food leftovers, and the remnants of this cake table that had 20+ specially made cheesecakes devoured by Nick & Zach's friends and family. Oh, and Reggie Wells even paid us a visit (you know, Oprah's make up artist, NBD). So why should visitors see the mess, and the clean up process and why the day after when wedding planners typically clean up right after the wedding is over? In this special case, the artist lead team valued all those in between moments as a part of the "art". Weird, right?! Yea. I would also add that this whole #BTS art performance just added to the whole queer AF approach to subverting wedding traditions. My point is...The wedding industrial complex pressures us to only share the "perfect" moments of our weddings. In addition to those perfect shots of our beautiful uneaten cakes, I also find beauty in the messiness of it all. As a curator turned wedding planner, this was the largest project I embarked on up to date (and my first wedding). Although there were many challenges and lessons learned behind the scenes, over one thousand people benefited greatly from a show that reflected their personal stories. It's been so inspiring to see all kinds of people walk through those doors, and even more inspiring to see them open up to us with their traumas, their histories, their joy, and everything in between. It proved that art really does connect us, including strangers. Nick & Zach told me I made their dreams come true. But in reality, they made dreams come true for those who saw themselves in this show and found a place to freely express themselves in a joyful escape. They also made MY dreams come true by believing in my vision, and trusting my advice when it came to curating and community outreach. They helped me to believe that that with art, anything is possible. Even in a wedding. This was not just about Nick & Zach’s wedding, it was something so much bigger. It's been so inspiring to see all kinds of people walk through those doors to see such a unique wedding that utilizes art to bring all kinds of communities together in the name of love. It truly was a queer paradise where love wins. Thank you to all the artists and performers who provided this platform for the community to shed smiles, tears, and sniffs of 80's perfume nostalgia. Oh, and thanks to the puppies that came through too. Special thank you to Spacecamp gallery, our volunteers, vendors, and sponsors who made this unforgettable community event and space possible! Huge thanks to our grant support provided by Free Fall Baltimore from Baltimore Office of Promotion & The Arts and Awesome Foundation-Baltimore! And a big hug to all our sponsors who donated to our Hatchfund! Our photographers Kiirstn Pagan, Tiffany Jones and Akea Brown who the photos on this post! Twigz and Tweed for the plant and furniture rentals! In loving memory of Alice Gadzinski. Michelle Ivette Gomez is an arts professional with a love for romance and art, and a passion for bringing people together and telling stories through art. She received her MFA in Curatorial Practice from the Maryland Institute College of Art where she focused on co-creative curatorial practice and expanding traditional methods of exhibition presentation in collaboration with communities. 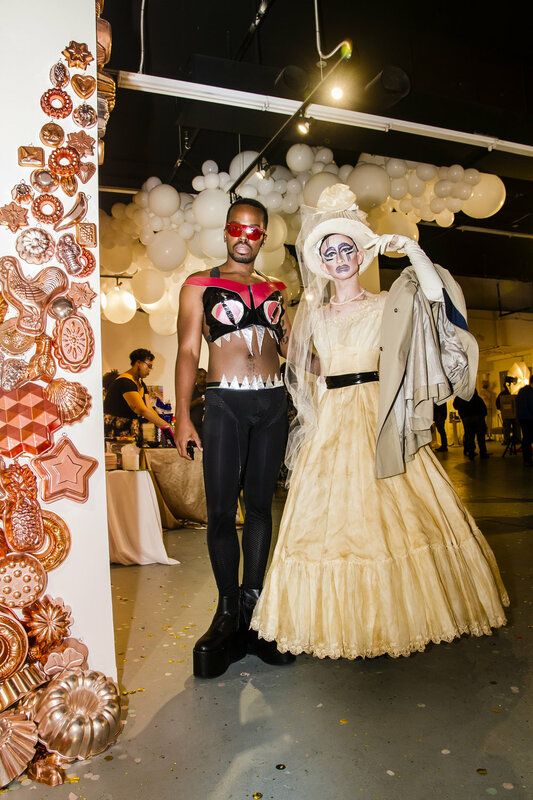 As the Founder & Creative Director of Creative Unions Event Design LLC, the first event planning company dedicated to integrating contemporary art into life’s celebrations, she views marriage celebrations as specially curated art exhibitions that bring people together to celebrate and express unique love stories. Sign up for the newsletter to get inspiration for your Creative Union, directly in your inbox! Various photographs on this website are provided by Zachary Z. Handler, Luke Wayne Photography, Rafael Soldi Photography, Tiffany Jones, Kiirstn Pagan, and Akea Brown.